A team that includes a Virginia Tech plant scientist recently used life sciences technology to edit 14 target sites encompassing eight plant genes at a time, without making unintended changes elsewhere in the genome. The technology, a genome-editing tool called CRISPR-Cas9, revolutionized the life sciences when it appeared on the market in 2012. It is proving useful in the plant science community as a powerful tool for the improvement of agricultural crops. The ability to alter several genes at once promises to advance researchers’ understanding of how genes interact to shape plant development and responses to environmental changes. However, a challenge of this technology has been identifying the impact of editing on genomic regions that were not targeted. 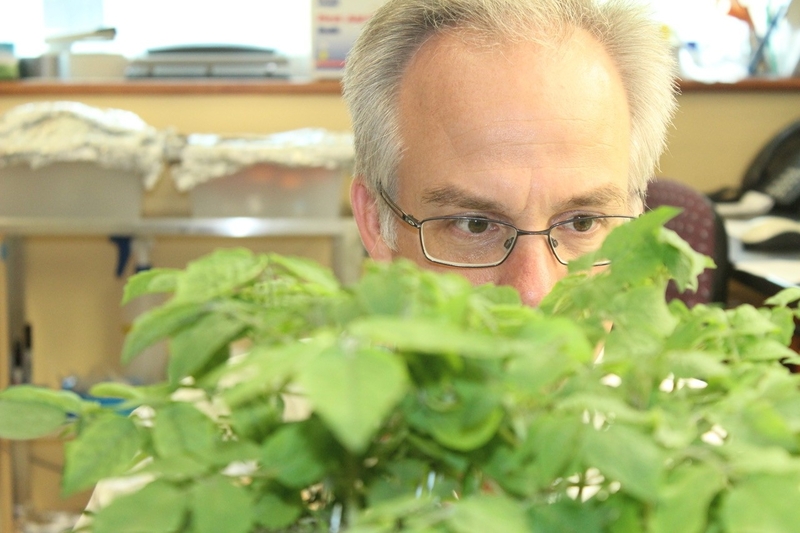 David Haak, an assistant professor of plant pathology, physiology, and weed science in the College of Agriculture and Life Sciences, developed a bioinformatics program using deep sequencing data to test whether the team’s editing of the genome of the Arabidopsis plant was both efficient and specific in its targeting. The team's finding that CRISPR-Cas9 is a reliable method for multi-gene editing of this particular plant species was published in PLOS ONE. “We were surprised to see that we had targeted gene editing efficiencies ranging from 30-85 percent with no detectable off-target editing,” said Haak, who is also affiliated with the university’s Fralin Life Science Institute and the Global Change Center. "The ability to edit gene function in a specific manner using CRISPR-Cas9 has the potential to really change how we study plants in the lab and improve crop efficiency,” said co-author Zachary Nimchuk, an assistant professor of biology at the University of North Carolina. “But, there have been concerns about the potential for undesired off-target effects. We tested this in plants, targeting 14 sites at once, and found no off-target events in a large population of plants. Our data expands on previous work to suggest that, at least in Arabidopsis, off-target events are going to be extremely rare with Cas9." Other paper co-authors were: Brenda Peterson, a lab technician at the University of North Carolina; Marc T. Nishimura, a post-doctoral fellow at the Howard Hughes Medical Institute; Paulo J.P.L. Teixeira, a post-doctoral fellow at the Howard Hughes Medical Institute; Sean R. James, a graduate student at the University of North Carolina; and Jeffrey L. Dangl, a professor of biology at the University of North Carolina.